The department of Ophthalmology consisting of fellowship trained and experienced consultants is certain to provide you with best services. 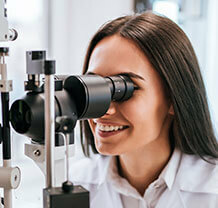 The goal is to provide comprehensive, high-quality, and state-of-the-art eye care in an accessible, supportive, caring, and user-friendly environment. It has always strived for superior outcomes and a high level of satisfaction for patients. The consultant ophthalmologists, optometrists, assistant ophthalmologist, nurses and staff have been working with exceptional efficiency to deliver the best eye care service. The staff has also been providing individual attention which is highly valuable for our patients, whether they are visiting for a routine check-up, outpatient consultation, simple or surgical procedure, or emergency care.